Late with your credit card payment, even by a few days? Your procrastinating could prompt a new "penalty rate" of up to 29.99% if your Visa or MasterCard has the Bank of America logo, the bank confirmed late last month. While this rate will only be applied to new purchases made after the penalty is applied (and "an account will be reviewed before it is implemented," according to the bank), it could be the new trigger for a cascade of bad credit experiences. For one of my good friends, the day her credit card rate jumped to 24.99% was the signal of a downturn that didn't end until she'd gone through bankruptcy -- all the more reason to find ways to (a) avoid being late on your credit card payment and (b) avoid using credit at all. In 2003, I closed the last of three credit cards I had and have since had to live a life full of crises but without credit. While not everyone would choose to live like this, there's no reason not to experiment with a credit-less life now, while your interest rate is still low and penalty-free. Dryer dead? Hang the laundry outside (or inside on drying racks if it's rainy) until your handy in-laws can come over and check it out. Dishwasher on the fritz? Believe it or not, it is possible to wash your dishes by hand until you have enough money for a new machine or the cost of a repairman. For most appliances, you can figure out a temporary solution until you either have the money or can find a cheap used replacement or an inexpensive repair. I use the emergency card only for true emergencies, such as a broken refrigerator or a busted heater in the winter. For the time being, let's just assume you don't have a personal escrow account for those inevitable car repairs or new tires or new brakes your vehicle suddenly needs. So what do you do if your car is in the shop and you can't pay for the repairs with the cash in your checking account for 10 days or three weeks or some interminable amount of time? Emergency? You bet! Well, what do most of us do when our cars are in the shop? We find a cheap workaround, such as catching a ride with a spouse or a co-worker, taking the bus or, if we live just a few miles from work, walking or biking. If you can do that for a few days, why not for several or for a week? While it may be an inconvenience for your family, friends or yourself, a little inconvenience is preferable to a credit crisis that could cost you a lot more than a little spousal goodwill (or wear on your shoe leather, as the case may be). 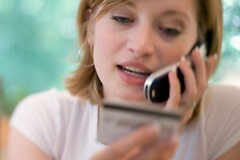 If you're like 99% of the people I know, a credit card expense won't be paid down right away and may not be for years. But if you have to pay the money in cash, you'll simply adjust other expenses like groceries, entertainment and clothes to make room for the car repair -- a smart approach in a month of unexpected expenses. For the purposes of this piece, I won't touch the enormous emergency expenses, the thousands or tens of thousands of dollars that major illnesses or accidents cost. Instead, we'll talk here about the less shocking costs: a few hundred dollars for a test not covered by insurance, or a series of co-pays for treatments that end up costing you several hundred dollars, or the cost of seeing a specialist or getting dental surgery. You could put it on your credit card at the point of service, where it will fester. Or you could make a payment plan. While some billing office workers can be extremely difficult to negotiate with, most people who work at medical practitioners' billing offices are reasonable people. They understand you need the service; that they'll get far less from you if they send you to a collections agency where they'll end up getting just 30% to 60% of the total billed, if they're lucky; and that they make most of their money on repeat business. Keeping a customer solvent and able to face the office staff means, in the end, less paperwork for them. So tell the office how much you can afford to pay each month; most will accept payments of $25 or $50 on small bills, and $75 or $100 on larger ones. They'll usually charge you a "carrying fee" or some similar small monthly amount, but it will almost certainly be less than you'd pay if you ended up with that penalty rate from your credit card company. In my experience, the costs range from 50 cents to two dollars -- nothing a credit card interest rate can't beat with its eyes closed. This is a touchy one, and boy, have I been there! You have time on Saturday for a grocery run, but you're almost out of cash and won't be paid until Thursday. You need shampoo and toilet paper and peanut butter and steak and artichokes and lemons and mustard and potato chips and they've got to be organic. Nearly $150 later, you've got what you "need" and you'll pay it off soon, won't you? I did it this way for my first 10 years out of college, and $22,000 in credit card debt later (not all from groceries, mind you, but still), I learned the hard way that I will not pay it off soon. You always "need" more groceries. When I went without credit cards and through a couple of very lean times, I learned that my "needs" could easily expand and contract based on the balance in my bank account. Yes, there are times which you legitimately might go hungry (or shockingly dirty) without using your credit card. But use it with caution. And don't use it without checking your cupboards and the back of your freezer first. There were a few times I had to dig in the cabinets for old lentils or cans of tuna; make salad dressing with yogurt instead of olive oil; go entirely without snacks for a few days; make my own cookies instead of buying a box. I've made shampoo last a few extra washes by filling the bottle with water and shaking. if you don't give yourself the wiggle room, you won't end up buying that extra-special conditioner to go along with your must-have shampoo. Life will go on without conditioner. Trust me. I'll bet if you stood a dozen people in a row and asked each one of them in turn, "Is taking a vacation an emergency expense?" they would all, affronted, say "Of course not!" in reply. And I'll bet, if you were to review the credit history of those dozen people, you would find that at least 11 of them had put vacation travel expenses on their credit card many times. We all believe that a vacation savings account is a good idea, but when it's time to take our vacation, we'd rather just count on paying these bills off later, right? I'm all for living in the moment -- in fact, I pay several hundred dollars each month for all those past moments in which I lived. But when you see those flash weekend fares or that fun opportunity to go with your friends to a sunny climate in the middle of winter, think about the you that you'll be in 10 years. Sure, you'll love looking back on the memories of that exuberant time in Cancun/Paris/India/Las Vegas. But will you love it enough to still be paying for it? To have it prevent you from taking a lower-paying job that makes you truly happy? To have it stop you or your partner from staying home with young children or having good enough credit to qualify for a mortgage? Well, you get the picture. In the end, it's hard for me to sit here looking out from my chair of experience and tell you, "This is not an emergency." Because you are (probably) young and you (probably) believe that your life is still ahead of you, with many years of always-increasing income and, perhaps, your life partner, too. I was that young person; I knew I'd always make a little more money each year. Indeed, I could have kept being that person, but I chose a different path that makes me happier -- and wiser and poorer and very, very much wishing my young self would have only used her credit card for emergencies.